Okay sisters. I need you to be honest. When you are having your quiet time, do you find things you read humorous? I will be completely honest and state that I do find myself giggling at some of the quiet time reading I do. In addition, when I find something funny, my mind immediately starts to wander in silly circles. Now as a minister’s wife, I feel guilty about not staying focused. Well, today I had one of these moments. I had completed my Bible reading and was enjoying the Journey devotional guide produced by Lifeway. The writer challenged us to “allow our task” to draw us closer to the Father Creator. That is when I laughed and my mind went into “wandering” mode. How in the world is the task of housework drawing me closer to God? I hate housework! Dusting makes me sneeze. Vacuuming is boring. Ironing is slave work. Besides I feel unappreciated when everything is done and no one notices. When I am forced to do these chores, I usually grumble. Hey wait a minute! As I am writing this blog, I have realized something in my blonde, chocolate overloaded brain. I need to be thankful that I have a family I can clean up after. God blessed me with these “nasty” (I am laughing right now) people. Oh and God gave me the arms and legs to do all this housework. Gee, and every time I sneeze while dusting, I should be thankful for breath. Hallelujah! Housework can draw me closer to the Father Creator! So girlfriends, what mundane task draws you closer to the Lord? As you answer the question, I will excuse myself so I can dance and praise the Lord with my Swiffer Duster and trusty vacuum cleaner. I sat at the gravesite of my dad on May 10 and I thought my heart would break. It seemed a short time ago we were at the same place but only burying my mom. In two years we watched my dad succumb to heart failure and finally on May 6, he met Jesus face to face and was reunited with mom. As sad as the day was and as heartbroken as my brother and I were, there in those quiet moments as we listened to TAPS being played by the Navy Honor Guard, I noticed something. The birds were still singing, the sun was still shining, and life was continuing on. As the burial ended and people began to disperse, I looked around me. People were laughing and visiting like it was a family reunion. In a sense it was. Many of those people had not seen each other in several years. Yes, life goes on. While I was standing there with tears running down my face, my youngest son, who always provides levity in serious situations, came up to me. He asked, “Do you notice anything wrong with me?” I didn’t. His wife then pointed to his shoes-two mismatched black dress shoes! He snickered, smiled, and stated, “Well, at least I got a left one and a right one.” I nearly choked on my tears as I laughed a belly laugh. Yes, life goes on. As we walked toward the cars, I looked in the distance and saw my husband playing with our precious 20 month old grandson. They were running in the grassy area and Gideon was giggling. “How fitting,” I thought. Life goes on. As a minister’s wife, we know all the answers in our head. We know the death of a Christian is not really a sad day because that person is with their Lord. However, we are human beings who are selfish and grieve for our own loss. Death is a part of life and none of us will escape it. Thus, life goes on. So, life goes on. There will be births, deaths, sickness, weddings, family reunions, etc for generations to come. God allows us a short time on this earth to do His work. He calls us to lead others to Him. When our time is up, He will call us home to live with Him for eternity. Just before we left the gravesite, a dear friend of 52 years came up to me. He gave me a brotherly hug and opened his jacket to reveal his inside breast pocket. He said, “Shh, I brought you some Happy Pills aka Peanut M & Ms.” We both laughed because his parents are with Jesus too and we both know that life goes on. Today is a day to remember those men and women who sacrificed their lives for our freedom. These brave men and women left the comfort of home, secure jobs, and their precious families and went to war against those countries who wanted to rule us and take away our freedom. Our nation is rich with individuals who secured our freedom. Our founding fathers fought against their homeland England in order to establish America. One aspect of the Civil War was the fact that all men are created equal and should be free. The World Wars continued to protect our nation against the enemy. Today, our service men and women fight an enemy who does not fight in a traditional way but through terrorism. Countless people have given their lives for our precious freedom. As we go off to our family gatherings, spend time at the lake or whatever you Memorial Day tradition might be, take time to pause and thank God for these selfless individuals who died for our freedom. Also, if you should see a military person or have a veteran in your family, tell them thank you for their service. Ladies, if you have read some of my blogs in the past, you know that sometimes I love to come up with acronyms. The Lord gives me these revelations as encouragement, not only for myself, but to share with others, to edify and to exhort those who may be dealing with the difficult trials of life. In the past few months, I have been dealing with a situation that has caused me a lot of disappointment, heartache, and grief, but God’s grace is sufficient. Understandably, life is full of blessings and “blow ups”, and at times, these may occur simultaneously (can I get a witness!). One thing that soothes and comforts in the not so pleasant situations of life is God’s amazing peace. Yes, I have an acronym for P-E-A-C-E. The Lord’s peace in the midst of pain truly is above all comprehension. I don’t know about you, but when I go to my Father and cry out to Him concerning all that is weighing on my heart, afterwards I feel like a huge weight has been lifted from my soul. I cherish my quite moments of talking with Him. In fact, He tells us to pray without ceasing (1 Thessalonians 5:17), and that we should always pray and not lose heart (Luke 18:1). As children of God, if we truly look at our circumstances in light of the promised joys of heaven, is there really any comparison? I know that on this side of glory, it is sometimes very difficult to focus on heaven when we are experiencing trials and tribulations on earth. But our Father tells us that these “light and momentary troubles are achieving for us an eternal glory that far outweighs them all”. (2 Corinthians 4:17). One day the Lord will take us away from all of this, and as the psalmist said, we may be weeping now, but joy is coming! (Psalm 30:5). Remember, our blessed Savior has gone to prepare a special place for us (John 14:3). In spite of what we may be going through, the Lord has been good to us in so many ways. The one blessing that supersedes all others is the fact that we have a Savior who gave His life to pay our sin debt, and because of His awesome sacrifice, the Father has blessed us with every spiritual blessing in heavenly places in Christ (Ephesians 1:3). I could go on and on with this one, but just think about all the many countless ways that the Lord has given you blessing after blessing! I hope and pray that this acronym encourages you in some way. Perhaps you may want to write it down, copy and paste it, or hide it in your heart as you navigate the journey of life. Opt for peace instead of a “pity party”, and watch how the Lord changes your perspective about what you are facing. His peace truly guards our hearts and minds in Christ Jesus (Philippians 4:7). Our Lord is so amazing! May we keep our eyes fixed on Him! Do you ever find yourself too busy to do what needs to be done? Do you ever over-committed? Do you ever get so busy you get frustrated? Being a school teacher, that is the way I feel every year about this time. There is soooooo much that HAS to be done to complete the year. This week, I have been taking up 110 permission slips, taking up money and making final arrangements for field trip on Friday.After school today, I will have to go purchase colas, watermelons and dessert....make sure we have enough coolers, etc. On top of that....our final grades are due; classroom inventories are dues; our textbook forms are due; I am getting our Awards Day together, etc. for next week and trying to pack up my classroom for the summer. Besides EVERYTHING at school.....life goes on. We have church obligations, hospital visits to make, funerals to attend and we try to squeeze time in for the grandbabies, etc. My last day of school will be the Wednesday after Memorial Day and our VBS starts the following Sunday night. WHEWWWWWW........this is an extremely busy and stressful time for me. However....in spite of everything, I have to make sure that I do not get so busy I leave my time with God out. I have to even work extra hard to keep a positive attitude and keep my spirits up.....because folks are watching...........and Satan will use whatever he can to try to tear us down. I know that all of you are just a busy as me. Just a reminder.....make time for God....keep a positive attitude.....keep your spirits up; let others see Jesus in you and remember, as Tara wrote last week.....THIS TOO SHALL PASS. 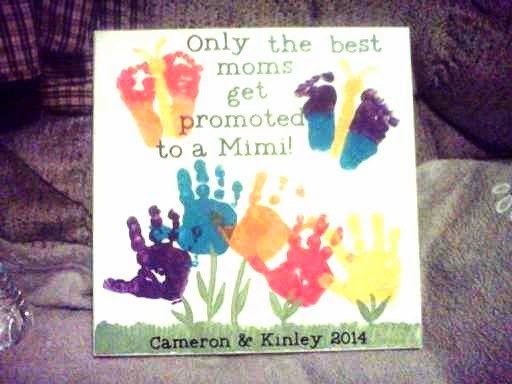 BRAG MOMENT: This is the Mother's Day Present that my grandbabies gave me because they have such a creative mom. Thank you, Cameron & Kinley. Marriage should be FOREVER.....until death do us part. However, in the sinful world that we live in, that is not the norm. Every time I turn around, I hear of another marriage that is in trouble. I know that this is just Satan's way of gaining control; if He can break down the family, he has won his biggest battle. It breaks my heart that people are so quick to "throw in the towel." I do realize that many times, divorce is unavoidable because Satan has really taken control; for example - adultery, abuse, etc. BUT....it seems as if, lately, I hear more and more marriages crumbling because "they are not compatible" or they "no longer love each other" or they are "tired of each other". Maybe love stories in books, magazines or movies have given us a warped sense of what true love and marriage is. Marriage is not a one time commitment. Marriage is not all fun and joy. Marriage is a full time job for the rest of your lives. It is not even a 50/50 give and take................you should be willing to give 100%. Marriage is an unselfish, binding contract. Marriage is a commitment to each other and to God; a contract that is to not be broken. Lack of Communication is the root of many problems. I know that I am preaching to the choir.....but ladies, as leaders, let's encourage our ladies of the church and women we come in contact with to NOT GIVE UP. The world is saying......throw the towel in. Let's be there to help encourage them and show them that that is the coward way out and not the path that is pleasing to God. 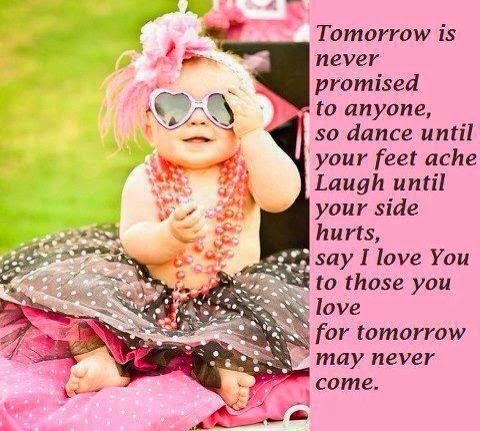 And as I wrote yesterday, everyone needs to remember....we are not promised a tomorrow. We are never promised a tomorrow. When it is "your time" nothing can protect you. In the last few months, it seems as every time we turn around, there is another funeral to attend. Some are of bodies that are diseased. Some of the bodies are just worn out. Some are of sudden illnesses and others are "accidents". No matter the circumstances or reasons, for HUMANS here on EARTH (the remaining family and friends)....DEATH IS NOT EASY. Roger and I have experience two types of deaths with both of our fathers. His dad was killed in a freak accident; trusses from a building site fell on him and killed him suddenly at the age of 54 years old. That was very hard.....nothing prepared us for his death. My dad was on the kidney dialysis machine for 20 1/2 years and we literally watched him slowly die before our eyes at the age of 62 years. That was very hard also. It is very hard for me to remember a time when he was not sick. In the spiritual sense, death is the ultimate reward; being in the presence of the Lord. However, in our feeble human minds, we can not comprehend "eternal". It is hard to imagine....beyond here on earth. Also, in our selfish, humanly minds, we do not want to ever "let go" of our loved ones. This past week, one of my 37 year old co-workers lost her husband to a tragic vehicle accident. She is grieving. His parents are grieving. His children are grieving. His granddaughter is asking for him. His other granddaughter will never know him. We never know when our time will come......or when one of our loved ones' time will come, so it is very important to ALWAYS BE READY. Tell your loved ones you love them and mend broken fences. We are not promised a tomorrow. For Humans.....DEATH IS NOT EASY.......but God will see you through it. Ladies, know that I love you and pray that it is not in God's plan for you to personally experience this pain, but that you will be the rock to help others that are hurting....in your church family and community. No body likes this phrase. No one wants to think about it. Some "preachers" won't even it acknowledge that Jesus Himself said it first. "You will have trouble." Somewhere, somehow, sometime long ago through happy ending sit-coms, and happily every after fairy tales, we all buy into this notion that everything is supposed to work out and end up just how and when we want them to. Honestly, I believe God put this desire in all of us so we would seek our "something more" in Him. We just want it now, on our time frame, without the "trouble." The best fictional stories all have conflict. The best non-fiction stories all have it too. We want to know how the hero or heroine deals with "trouble" through the "seasons" or "seasons" of their lives. We long to know how it ends. Yet somehow, we want the easy path. We want our lives to be "trouble" free. Why is that? No one likes the "trouble seasons." God is writing His story with our lives. In the sunny "seasons" and the rainy ones, He is telling the world about His love for us, His people. Just look at Jesus . . .
Jesus had tough "seasons" of His life too. Really tough. And since He did, shouldn't we expect them in ours? As I've blogged this week, I have been very aware that some of you may be going through "trouble. "I know of ministers' wives in our association that are facing various trials and heartaches. Even my fellow blogger, Vickie, is coping with her father's final homecoming this week. This verse is my favorite. The phrase, not so much, but the verse - most definitely!!! Dear Sister, look at the powerful promises Jesus' squeezes this truth about "trouble" in between! 1. In Him we may find peace. He has told us these things so we know we are not alone in our "season" of "trouble." 2. He has overcome the world. He has guaranteed that "this too shall pass" with His victory over this sinful, dark and troubled world. Yes, we "will have trouble." Jesus said so and He never lies. But we cling to His other words. We "seize the day," this day, that He's given us and know that "this too shall pass." Till next time sweet sister, know that you are in my prayers as you are in whatever "season" you are in. . . I'm pretty sure everyone knows where the phrase, "Seize the Day," comes from. Carpi Diem. Latin. Very, very old. It is used a lot this time of year. Graduation "season" is upon us. As a 12th grade Sunday School teacher, I know all too well what "season" it is. My refrigerator has become a bulletin board of sorts with various graduation ceremony announcements and invitations to celebratory parties. The grads are full of hope and optimism in this "season" of their lives and, at every turn, they are being encouraged to "seize the day." As I wrote in my earlier blog, "this too shall pass." Those of us who have been there, done that and have the t-shirt (or two, and maybe long sense added to the rag pile) know this to be true. All the excitement and promise of the recent high school graduate will fade into another "season" of life: collegiate or work responsibilities. With the certainty of the "passing" of this or ANY season, the call to "seize the day" should take on an urgency. What is it that we should be doing on this "day" of this "season?" My months of May have become increasingly busy as my girls have gotten older. Recitals for piano (Riley) and ballet (Piper), recognitions, end-of-school-year parties, Mother's Day, birthdays, appreciation gifts for teachers - my to-do lists are really out of control. This "season" I find myself in is quickly becoming overwhelming. Yet, each day, every morning is a new beginning, a precious gift from a loving Father who desires us to live in the joy and peace His presence with us brings. Father, forgive me for being so caught up in this "season" that I find myself too busy, too self-centered, too circumstance-focused that my relationship with you has suffered and I am missing the things YOU have called me to in this "day" that you have given me. Dear Sisters, are you missing blessings because you are using your "season" as an excuse? I know I have. Or maybe your "season" is causing you to cling more tightly to our Father, than ever before. Whatever the "season," "seize the day" and know you have been prayed for today . . . Does anyone know the origin of the phrase, "This too shall pass." Is it Biblical? I know I could probably do a Google search on it and have an answer . . . But, honestly I really don't care how the saying got started. Dana, in her last post, talked about the "season" that she finds herself in. We are all in a different season aren't we. Each of the bloggers that write for this blog were chosen because we are all in a different season of life. I'm the "young" one, the one with kids, with kids at home. 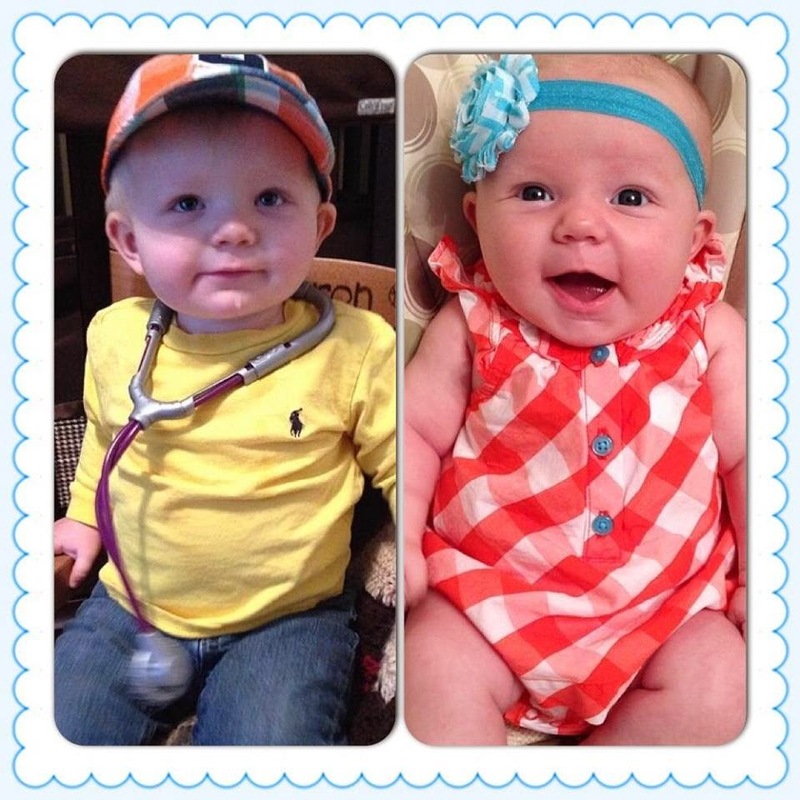 My kids are the ones that remind me all too often that "this too shall pass." Sometimes I realize that "this" is "passing" all too quickly. My oldest starts middle school in August at the same time my middle starts kindergarten. I find myself thinking, "Can this really be happening already?!" It seems like just yesterday I was wondering if the oldest would survive her first days of kindergarten and whether or not the middle would ever be potty trained. Other times the "passing" of whatever "this" may be, seems to be happening way to slow. My youngest, at seven months has recently reverted back into a middle-of-the-night feeding. In my head I know that she won't always wake in the wee hours crying for me to feed her. So, I am trying to train my heart to appreciate the stillness with her while I rock and give her a bottle. But it is hard as my body resents the interruption in my REM cycle and longs for the sleep I am missing. We are all on our own journeys with our Lord. His word has promised us that nothing in our lives happens without His planning and purposes. We are assured that good will be brought out of whatever "season" we find ourselves in. We cling -or need to be clinging- to His promises that He will complete what He has begun in us. We know that "this" is not being wasted, not in us or in His grand plan. And we know that "this too shall pass." Oh the lessons I am learning….